Do you want to allow users to easily submit support tickets? 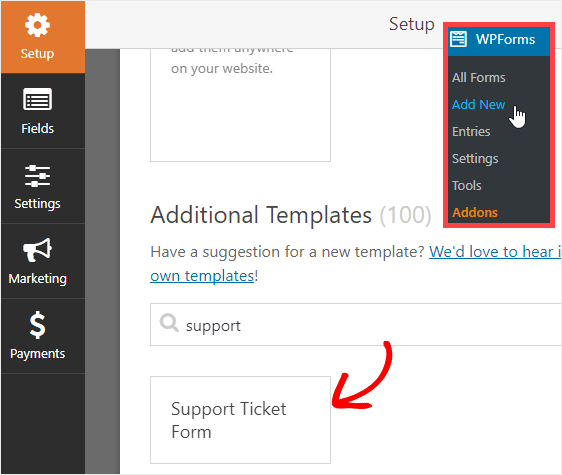 WPForms comes with the ticket form template that allows you to create a support ticket with just a single click. In this article, we’ll take a look at how to create a support ticket form easily with our ticket form template, as well as share some support ticket best practices. 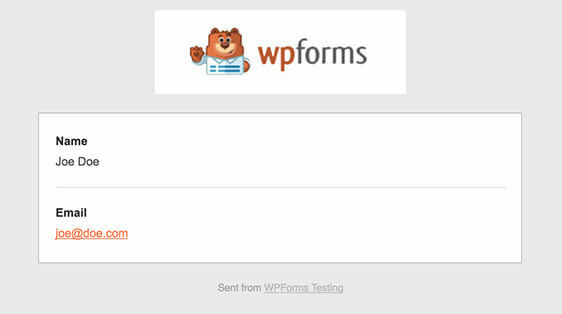 WPForms allows you to create a support request form on your site quickly and easily. All you have to do is to choose the Support Ticket Form template, customize it per your needs and publish your form on your site. 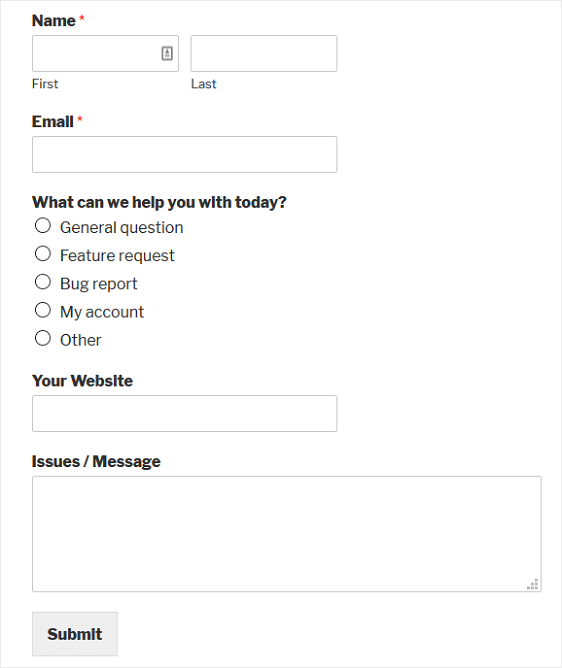 Let’s take a look at a step by step guide on creating a support request form on your site. With this addon, you’ll be able to access the pre-built support ticket form template, as well as tons of other industry and niche specific templates for creating customized forms for your site. This saves you the time needed to manually add support ticket form fields to a simple contact form. On the setup screen, name your form and scroll down to the bottom of the templates screen where it says Additional Templates. Type “Support” into the search bar and the support ticket form template will appear. When the pre-built form loads, most of the work is already done for you. 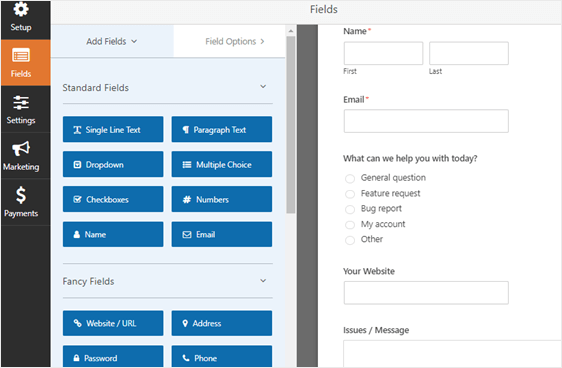 You can customize your form by adding, removing, and repositioning the fields per your needs. To add a field to your form, just click and drag on the field name on the left side. To reposition the fields, you can drag the fields up and down. Lastly, to customize a field, click the field in the preview panel and make necessary changes as you wish. When you have all the form fields you want on your support ticket form, click Save. Spam Prevention. Enable the anti-spam honeypot feature to prevent spam form submissions and keep your website secure. This feature is automatically enabled on all WordPress forms. If you decide to use another form of spam prevention, you can either unclick this option or continue using it with other spam prevention features such as recaptcha. Notifications are a great way to send an email whenever a support request is submitted on your website. In fact, unless you disable this feature, whenever someone submits a support ticket form on your site, you’ll get a notification about it. 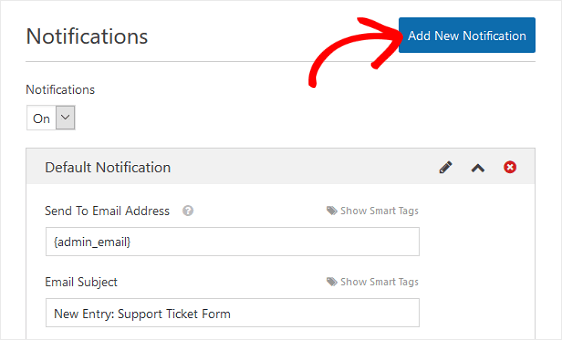 If you use smart tags, you can also send a notification to the site visitor when they submit a help ticket, letting them know you received their request and will be in contact shortly. This assures people their request for help has gone through properly. 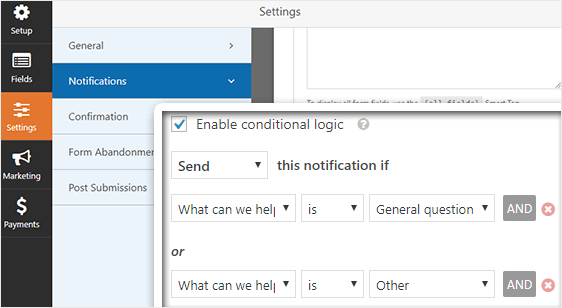 You can use WPForms’ conditional logic to notify the right person in your organization based on the user’s selection when a support ticket form is submitted. For instance, you can assign general questions to your sales team and bug reports to your support team. This way you can assure that the submissions are handled by the right person and also ensure a speedy response. In this example, let’s say that you want to submit General question and Other selections to your salesperson and Bug report, Feature request and My account selections to your support staff. Here’s how to do this. To start, go to Settings » Notifications. On the right-side preview panel, scroll all the way to the bottom and select Enable conditional logic. Then, choose the appropriate selections from the dropdown as seen in the screenshot. For this example, we’ll choose Send this notification if what can we help you with is General question or Other. The key to adding two conditional logic rules is to click the plus (+) sign to add additional rules. Lastly, scroll back to the top and change the Send to Email Address at the top. For our example, we’ll add the email of our sales team. This way whenever a user submits a support ticket form and selects General question or Other, their request will go directly to the sales team. Once that’s done, click Add New Notification and specify a name for the notification for your internal reference only. Then, repeat the same steps as above, only this time you’ll change the conditional rules to reflect which user selections you want sent to your support team, which will be Bug report, Feature request and My account. You’ll also add the email of the support team under the Send To Email Address section. 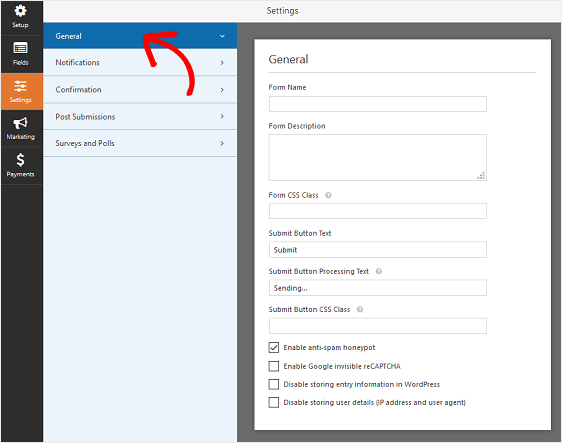 For more details on how to create support ticket form that has selections for users to choose from, check out this tutorial on how to allow users to select recipients. 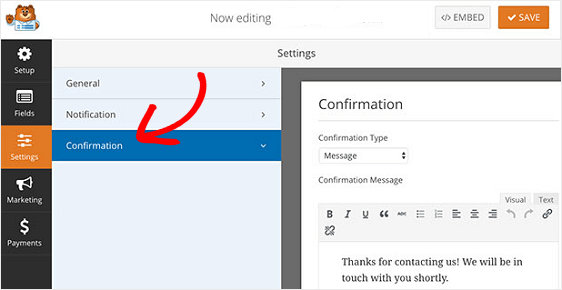 If you need to send more than one notification, for example to yourself, the sales or support team, and your customer, check out our step by step tutorial on how to send multiple form notifications in WordPress. 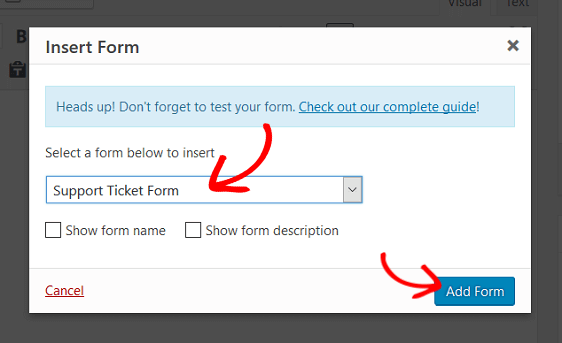 Form confirmations are messages that display to site visitors once they submit support ticket form on your website. They let people know that their request has been processed and offer you the chance to let them know what the next steps are. Message. This is the default confirmation type in WPForms. When a customer submits a support ticket form, a simple message confirmation will appear letting them know their request for help was processed. Look here for some great success messages to help boost customer happiness. Show Page. This confirmation type will take site visitors to a specific web page on your site thanking them for their support request and telling them when you’ll be in touch with help. For help doing this, check out our tutorial on redirecting customers to a thank you page. In addition, be sure to check out our article on creating effective Thank You pages for boosting customer loyalty. Let’s see how to set up a simple form confirmation in WPForms so you can customize the message site visitors will see when they request your help. Now you’re ready to add your support ticket form to your website. After you’ve created a support ticket form, you need to add it to your WordPress website. Then, publish your post or page so your support ticket form will appear on your website. Now let’s take a look at some support ticket form best practices to boost form conversions and customer satisfaction. If you’re using Zendesk or any other ticket management tools, WPForms lets you easily integrate your form with your favorite ticket management tool. All you need to do is to install the Zapier addon on your site. For help with this, read how to integrate your form with Zendesk using Zapier. Do you use a multipurpose form on your site and suspect that too many visitors abandon the form without completing it? Then you need to enable the Form Abandonment addon on your site. Our Form Abandonment addon allows you to unlock more leads by capturing partial entries from your forms. This way you can follow up with interested prospects and possibly convert them into customers. Using form abandonment is greatly helpful if you’re using a multipurpose form that allows users to contact you for different purposes like support requests, pre-sales queries, and more. You can look here to read more about using Form Abandonment with WPForms. Sometimes it’s helpful to have a screenshot of a particular issue that’s plaguing your users. That’s why adding the ability for users to upload files on your support ticket form using WPForms’ File Upload addon is so helpful. Easily let people upload images types like .png, .gif, and .jpg so you can better troubleshoot their problem form the beginning and provide quicker responses. You can also let them add documents, audio, and even video file types to your form too. For help with file uploads, check out this documentation on adding file upload form fields to your WordPress forms. And there you have it! You now know how to create a support ticket form in WordPress, as well as understand some important support ticket form best practices to boost conversions and provide better support to your customers. If you want to gauge your users’ experience with your support team, read on to find out how to create a Net Promoter Score survey in WordPress. And if you want a more detailed account of how people feel about your company as a whole, customer support included, find out how to add a Likert scale to your WordPress forms.